It is a slow week for Colonel Light and his surveyors. On 23 October deputy surveyor George Kingston finally arrives at Rapid Bay, after some weeks on Kangaroo Island. It is not clear why he delayed there so long, but his arrival means that Light can divide his forces to cover a greater area. Progress is imperative. We hear one last time from George Martin, captain of the John Pirie. In a long letter to his wife Mary, written from Hobart on 29 October, he provides a summary of the journey from his perspective. Apparently he was unimpressed with Kangaroo Island, which he dismisses as ‘a most wretched & barren place not worth anything’, in contrast with the mainland, which he describes enthusiastically. ‘I must confess, that in all my travels I never saw so fine a country before & abundance of fresh water’. We learn that Mary is to join him and that they may seek to join the settlers in South Australia. Although Light does not yet know it, the Africaine is fast approaching. On 23 October Mary Thomas reports passing Cape Leeuwin and the ship makes good progress across the Great Australian Bight. Several whales pass in front of the vessel, spouting up water. 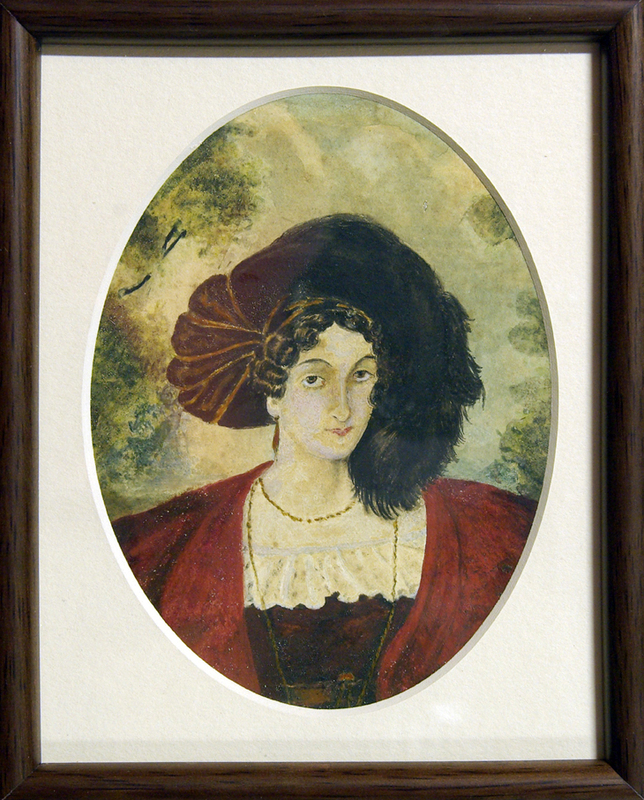 Mary Thomas, painted by her daughter Frances, aged fourteen. 1834. Image courtesy of the Estate of Joan Kyffin Willington. Thankfully for the survey party, the Buffalo is further behind. On 28 October it is approaching the coast of Africa, although still some distance out. Young Bingham Hutchinson reports fine sailing conditions, which is good news for the young mother in labour on board. Her new baby is born safely that morning. The atmosphere is more stormy in the captain’s cabin. Hindmarsh seeks his secretary’s opinion on the extent of his executive powers as governor and is not pleased with the answer. Stevenson argues that the governor should act in concert with his Executive Council: Hindmarsh apparently announces that he is ‘determined to act singly and uncontrolled’. The stage is set for subsequent battles, although at this stage Stevenson is inclined to think that Hindmarsh will ‘probably come or be brought to his senses ere he be called upon to act’. 29 October-Very sudden changes, hot and cold alternately, with showers. At five p.m. Captain Lipson and Mr Pullen arrived in the hatch-boat, from Nepean Bay. I wrote to Captain Rolls of the Cygnet to receive on board Captain Lipson and his family and proceed to Port Lincoln. Robert & George is going to school to morrow to Mr. Giblins Father, a very good school at New Town where I have got them to take both, through favour, for fifty pounds a year, I have provided them well with everything, & I am happy to say they are fine Boys & loved by everyone who knows them, I have great hopes in them, & I trust in God, that my dear girls will prove a comfort to us also – I hope & trust you are all well in health, and that you have been abble to mannage to rub through. I have wrote to Mr Angas who I have no doubt will render you every assistance in his power & advance you what money you may require to fit yourself & children out little respectable, and also procure you a passage out, either to Kangaroo Island or Van Diemens Land, but I think you had best if possible endeavour to get to Hobart Town first, & I will see you shall be provided for on your arrivel, but should you arrive at Kangaroo Island first, you will find yourself well received, I shall have a house built, and a garden for you before you arrive; endeavour to provide yourself & children as respectable clothing as your means will enable you, I am thank God in better health than ever I was & getting very lusty, & I have every prospect of dooing well, having an oppertunety of making a good deal trading backwards & forwards to the —. Mrs. Stephens is inclined to afford me every oppertunety of adding to my stock, therefore with the blessings of God I trust we shall yet see better days, & God send you safe to me again, The best month for you to leave England so as to insure fine weather will be in the months of June or July, I hope your brother & all his family are all well and in prosperety, I have wrot to them, & I hope & trust Mother & Eliza with her children are also well & that you are friendly with all for belive me my dear Mary that it is far more pleasing to make friends than enemys, I sepose Parnell is dead, & I trust he died a christian, & confeced his falshoods, should your Mother & sister come out to this part I will do all I can for them, give my love to them, also give my love to Mr. & Mrs. Barrow, Carters, Quillys, Ann & all inquiring friends – Mrs. Lord lives in the country and I am informed she looks as well as ever, Should you see Mr. Simpson the Father of my secont mate give my best respects to him & his family & tell him I have great pleasure in giving a good account of his son, he behaves himself mutch to my satisfaction, he has been very attentive to my two Boys, in teaching them to read and write; & I shall not fail in advancing so soon as I see a good oppertunity. OCTOBER 23.-The wind much calmer. At 2 o’clock we came abreast Cape Leeuwin, the first pomt of New Holland, having passed Swan River, but the land being a hundred and fifty miles distant, of course we saw nothing of it. ere he be called upon to act. mainsail: down topgalt yards in the forenoon. Evening. Strong breezes & heavy squalls occasionally. Wind West. Friday, Octr 28. More moderate & cloudy. A baby born this morng. 9153. Lat. 35E49′ So. Longe 0E40′ Wt. Water on board, 100 tons. OCTOBER 29.-This day it was still squally. Several whales seen; one came alongside and passed under the bow of the ship, spouting up water. Light divides his survey team into three and prepares to go to Port Lincoln, leaving Maria Gandy with Dr Woodforde at Rapid Bay. The Africaine reaches Nepean Bay and six of the young men decide to walk across the Island. The Buffalo passes Cape Agulhas on the tip of Africa. The moral of the story is never hold a Divine Service (“Buffalo” 23 October) without first shortening sail, as you never know what umbrage Aoelus or Zephyr (Greek God of the west wind) might take. Thanks, Evan. Good advice, I’m sure!